Next Thursday night (12th Jan) from 7pm the InterContinental are holding a Spanish night in their Palm garden. 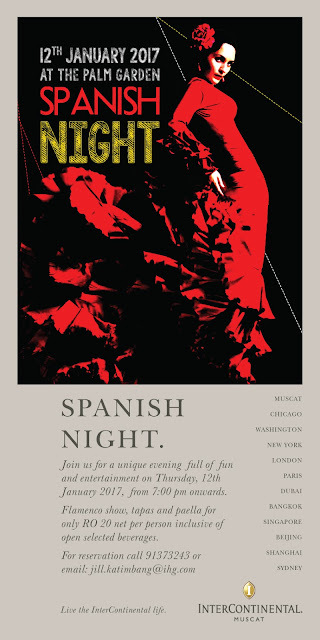 Its a pretty good deal, plus the weather is great right now so it's nice for a spot of al fresco dining - RO 20 net per person which incldes a flamenco show, tapas and paella, all washed down with an open bar (of selected beverages). That's about as good a deal as you're gonna get in a hotel in this town for open bar on a Thursday night!